This is a post I wrote for the Nerdy Book Club last week. It highlights important information from The Read Aloud Handbook by Jim Trelease. My parent group and some staff will be hosting a book club around this resource. I have been asked a number of times how our parent-teacher book club will go. To start, we received a local grant to purchase several copies of the Read Aloud Handbook along with many of the titles Jim Trelease recommends. Every first Tuesday of the month, we will facilitate a conversation about this resource. Our group will gather during our monthly PTO meeting. I plan to moderate the conversation with questions from the two chapters we read before the meeting. I will also post the questions on Twitter using the #ptchat hashtag so anyone can join us from home. Parents who attend will get to take home different titles to read aloud to their kids. At the next book club meeting, they can bring back those titles and exchange them with other parents for new ones. We hope this dialogue about books and the benefits of reading aloud will extend beyond our monthly gatherings. Once our book club has ended, we will put these titles into Little Free Libraries in the area (also grant-funded). They will be installed in our surrounding school community. Families will have more access to books regardless of their current living situation or available resources. 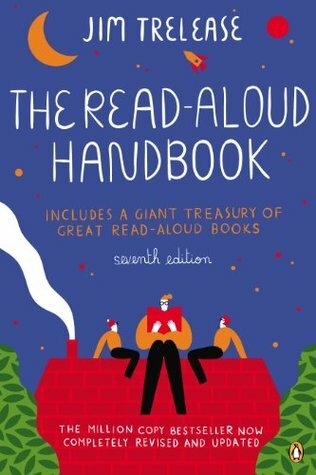 Starting in January, parents and staff at Howe Elementary School will join me in reading The Read Aloud Handbook, 7th edition by Jim Trelease (Penguin, 2013). Our goal is to create more awareness of the importance of reading aloud both at home and at school. At each meeting, we will also be taking home some of Jim’s suggested titles to try out. In preparation for our monthly conversations, I have listed my top ten takeaways from this resource. These conversations will take place every first Tuesday of the month at 5:30 P.M., both in person and on Twitter at #ptchat (thanks to Joe Mazza for encouraging us to use this hashtag). We hope you can join us! Love how you are having a PD with your PTO. How smart!! I am looking forward to having the conversations with them. One of the misconceptions I plan to clear up is that we can stop reading aloud to our children once they know how to read. Not true! We should read aloud to them as long as they let you. When selecting books with my kids, we usually try to aim for one grade above their independent reading level. As my kids get older, the choice and interest for books to read aloud greatly expands. My most recent favorite is The Year of Billy Miller by Kevin Henkes. This is such a valuable undertaking…kudos to you! I have a quick question: What other books have you read together as a staff that you can recommend? I remember a blog post of yours on this topic, but I’m having trouble finding it. Thanks! The one book my whole faculty read together was Teaching Essentials by Regie Routman (Heinemann, 2009). This book study took place in 2011-2012. We chose this book because we were engaged in the Regie Routman in Residence Reading-Writing Connection professional training at the time. It’s an excellent resource that any educator can pull wisdom from. My leadership team and I have been reading Building a Professional Learning Community at Work by Parry Graham and Bill Ferriter (Solution Tree, 2010). It is very practical and has a lot of activities and templates a school can use to foster better collaboration among staff. Prior to me being a principal at Howe, I think my staff read Choice Words by Peter Johnston. We have also engaged in some close reading of the Richard Allington article in Educational Leadership: Every Child, Every Day (ASCD, 2012). As for a blog post, the only one I can recall at this time is “My Island Books” (https://readingbyexample.com/2013/02/17/my-island-books/). I think many of these titles would make for excellent book studies.